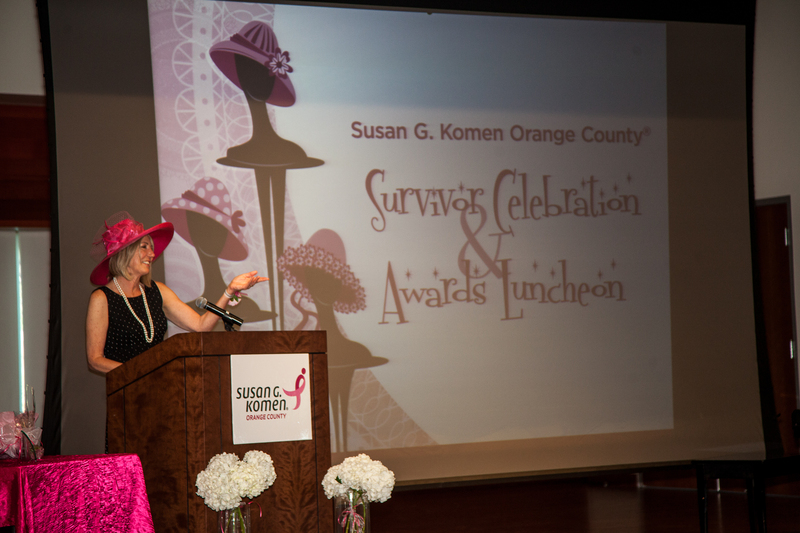 Three strong and inspirational individuals were recognized at the 2013 Komen Orange County Survivor Celebration and Awards Luncheon on August 11 , in addition to the many more being celebrated throughout the day. As in years past, this is always a wonderful event where we can give back to inspiring survivors, co-survivors and advocates from within the Orange County community. Orange County Sheriff-Coroner Sandra Hutchens, who, in October of 2012 announced her diagnosis with Stage III breast cancer, gave a speech that was inspiring, emotional and humorous. We are so grateful to her for coming out and sharing her experiences and stories with the award recipients and all those in attendance. This was the first event where she shared her deeply personal story and she did it in a way that touched us all. 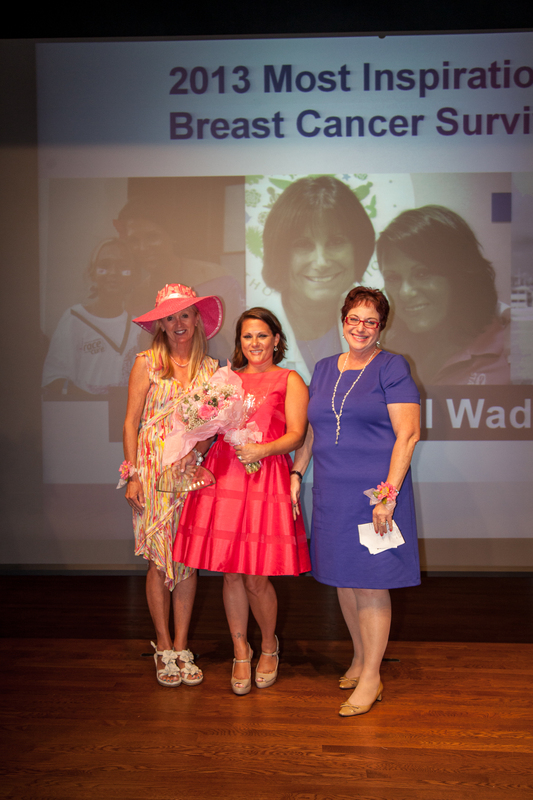 Three honorees were awarded Most Inspirational Breast Cancer Survivor, Most Inspirational Co-Survivor and Outstanding Breast Health Advocate. The Most Inspirational Breast Cancer Survivor recipient was Huntington Beach resident Georganna Hall Wadsack who, when diagnosed with breast cancer in 2011 as a 38-year-old single mother, was able to benefit from programs put in place by Komen Orange County which helped in both her diagnosis and treatment. She has since been married and invested herself in Komen Orange County by taking part in many events. She spoke during the Survivor Tribute at last year’s Race for the Cure and volunteered at Stand Up for the Cure which, with the help of Georganna and other volunteers, raised more than $100,000 last year! Georganna will be joining the advisory board for 2014’s Stand Up for the Cure. The Outstanding Breast Health Advocate recipient, Angela Acevedo, got involved with Komen Orange County after recognizing a need for community outreach and education with Latinas through her work at St. Joseph’s Hospital. She identified a need in a high-risk population and goes above and beyond her call of duty as a nurse navigator. Not only does she help those with breast cancer navigate what can be a confusing landscape of health care, but she also volunteers her time to Komen Orange County events, even going as far as traveling to Indiana to donate her own breast tissue at the Susan G. Komen for the Cure Tissue Bank at IU Simon Cancer Center in Indiana. Thank you to everyone who attended this wonderful event. Komen Orange County is proud to honor individuals leading the charge toward furthering breast health education and energizing science for the cure. 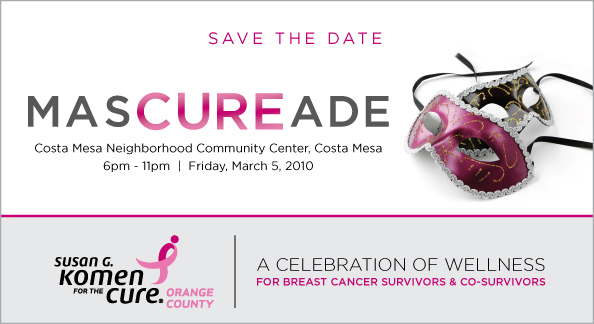 For more information about Komen Orange County, visit us at http://www.komenoc.org, or text “News” to 50555 for mobile updates . You can also text “KomenOC” to 50555 to donate to local breast health services and education in Orange County. August 24th– Join us for our last Team Captain Kickoff before the race! Come meet other team captains, learn effective ways to fundraise, and about all the race day logistics! September 22nd – The 22nd annual Komen Orange County Race for the Cure will be held at Fashion Island. If you haven’t registered yet, click here to join a team, start your own, or just support the race! We’re looking forward to seeing everyone at the starting line! At Komen Orange County, we admire the strength of all those affected by breast cancer. Know someone that represents the Komen fight? We are currently accepting nominations for Most Inspirational Breast Cancer Survivor, Most Inspirational Breast Cancer Co-Survivor and Outstanding Breast Health Advocate. Nominations are due no later than May 1, 2012. More details, including forms and instructions, can be found at http://bit.ly/GNpzeL. We are all part of one community and together, we grow stronger in the fight to end breast cancer forever. 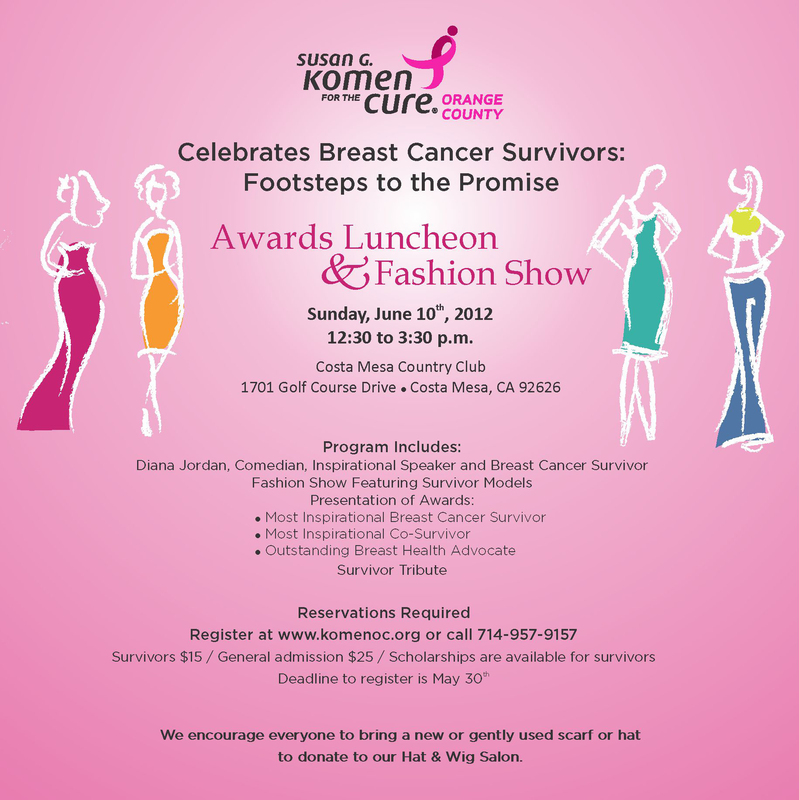 To honor the winners, we will be hosting a “Komen Celebrate Survivors: Footprints to the Promise” luncheon on Sunday, June 10, at Costa Mesa Country Club. Please consider nominating someone for this inspirational and moving celebration. We are also recruiting 12 breast cancer survivor models for the fashion show. More information and instructions to nominate someone or yourself can be found at http://bit.ly/Izv82z. The deadline to be considered is April 20, 2012. Stop procrastinating and buy your ticket today to MasCUREade. You save $5 per ticket – the price will go up next week. MasCUREade, a Celebration of Wellness for Breast Cancer Survivors and Co-Survivors, happens in just two weeks, on Friday, March 5, from 6 to 11 p.m.
What’s planned? 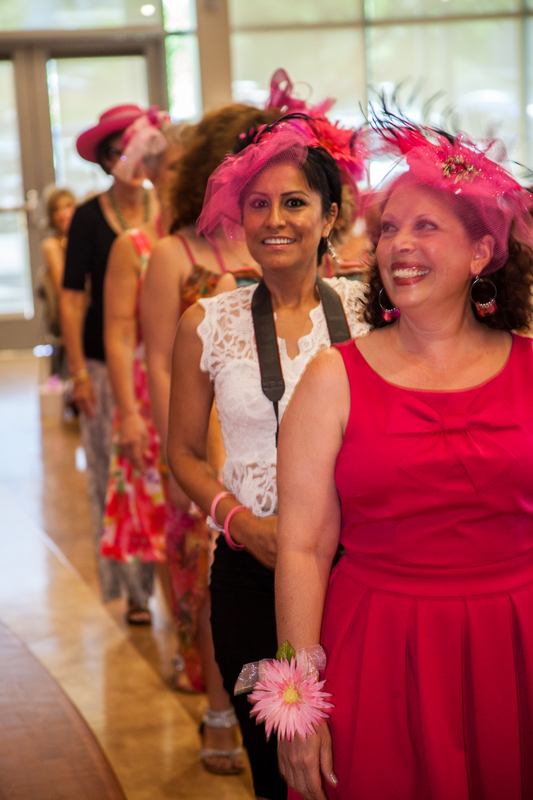 The Komen Orange County Affiliate promises fun, food, music and a meaningful tribute to survivors –the community gathering is dedicated to celebrating breast cancer survivors and co-survivors. There will be educational demonstrations and presentations, a photo booth and an opportunity drawing. One highlight is sure to be the recognition of Komen’s Most Inspirational Breast Cancer Survivor, Most Inspirational Co-Survivor and Outstanding Breast Health Advocate. Casual cocktail attire is suggested. The location will be the Costa Mesa Neighborhood Community Center. You can register and get your ticket today at www.komenoc.org, where you can also read a special message from the event Chair. See you there!